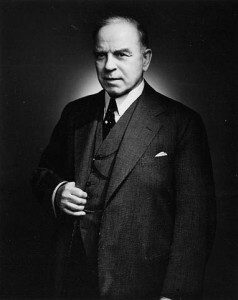 Canadian prime minister William Lyon Mackenzie King (1874-1950) was born in Ontario and educated at the University of Toronto. He was elected to parliament as a Liberal in 1908, and in June 1909 he entered Sir Wilfrid Laurier’s cabinet as minister of labour. When the government was defeated in 1911, King lost his seat. Chosen leader of the liberal party in 1919, King was elected by acclamation to a vacant seat for Prince Edward Island. At the general election of 1921 the Liberals were one short of a majority, but by winning the support of the Progressive Party, King held control of the House of Commons and became prime minister. During the Depression, the Liberals lost their majority from 1930 until 1935, when King returned to power and remained until his retirement in 1948.